Yes, she does great photos but not so great in front of a room full of people, which means that two of those pretty dresses weren't worn in the fashion show. However, the Mother/Daughter/Daughter combinations were worn and were well received by the attendees. First the black and white combination which consisted of a simple elastic waist maxi skirt for my daughter that she wore with a RTW white tank top, the out-of-print Vogue 8060 dress on Samantha and Butterick 6314 on Aleena worn with a furry type sweater. Miss Sammy wouldn't wear her sweater. The other combination worn was the Vogue 8060 floral print cotton guipere lace dresses made for both Aleena and Samantha. Their mother is wearing McCalls 6886 (my go to dress for her) in a stretch white gabardine that's lined. The floral lace was used for the sleeves so the dress would coordinate with her daughter's dresses. See Miss Sammy looking around - she even waved once! Two year olds and four year olds make horrible fashion show models even when modeling with their mother. Even when they parade around the house showing how they would model. Miss Lena walked with her head down the entire time, the entire family was amazed because she's such a show-off everywhere else. My closing picture is of Miss Sammy during the final fitting Friday night of her mother's dress...she loved the hat! 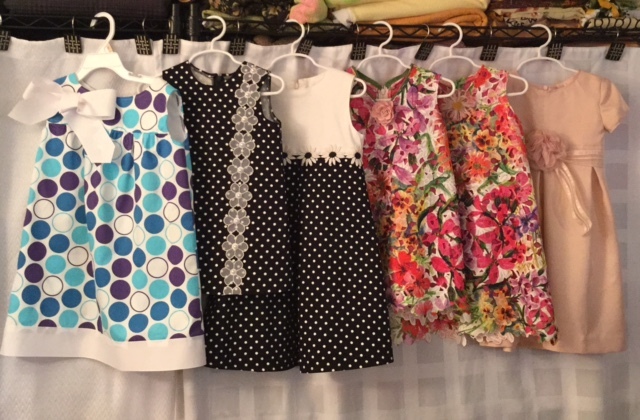 I've got one more post about the making of the dresses and then I'm moving onto spring sewing even though we're supposed to get snow here in the tri-state area tomorrow. I want to have some new pretties to wear when those first continuous warm spring breezes hit. Wow, such a beautiful family, Carolyn! Such cute outfits! Beautiful family and very gorgeous in their lovely outfits. Be proud! They're still beautiful with pretty frocks! My 3 year old grandson is the same way. At home, he's on stage 24-7. In public he adopts what I call 'the turtle posture'--goes into his shell. His mom (my daughter) was the same way when she was his age. Can't wait to see your Spring Collection! LOVE this post! You have such a beautiful family. I have to admit there is a certain charm to the "shy" of a little one. So green and innocent. Ha your post made me laugh. You know what they say about never working with kids and animals haha. No matter how confident they seem at home they can be so unpredictable in front of people they don't know. No matter all the dresses plus your daughter look cute. Good job on your part. Those kids! So adorable, even if they were "temperamental models!" Everybody looks so great in the outfits you made - I really love the mother/daughter outfits. They will be the best dressed family at church! I love the outfits!!! You did a wonderful job! Dang! I love your family. Hug them all to bits for me! Make them hug you back really tight! So sweet. You can never predict what kids will do but at least she let you take photos. Such cute outfits & especially the beautiful models !!!! So cute!!!!!!! The dresses are lovely! The outfits are so cute! You have a beautiful family. Your post made me smile on a day when I really needed it. Kids. They break your heart while filling it with joy. The dresses and family are lovely and give them all big hugs for me. Your girls look lovely in their dresses. Beautiful women, all of you! Absolutely lovely, what cute girls they are and mom looks pretty good too. Adorable even with her head down!! Your family is so beautiful and their dresses just makes them even more so! I love both combinations and know they do, too. You are an inspiration to sewers everywhere! Carolyn, the dresses are adorable and the ladies are too. Those are so sweet! The dresses and the photos. I love the floral print dresses in your three girls. Thanks for sharing the photos. I enjoyed looking at them. Everyone looks so pretty. And those little girl dresses are adorable. What precious girls and beautiful dresses. I so know about little girls. Mine are almost 4 and 6 and I know exactly how they would behave in that situation. The same as your two little sweeties! SEW VERY KIND OF YOU TO THESE WONDERFUL MOMENTS WITH US! GOD BLESS YOUR WONDERFUL FAMILY! Beautiful family, beautifully dressed. Many congratulations on the dresses they are lovely. Everything about this is so very beautiful! Enjoy every precious moment -- dreaming, sewing, dressing, and being together! Beautiful family. And such cute dresses. They look amazing - head down and all. Great job on each dress. All your girls are so beautiful. You outdid yourself on those dresses! omg I'm dying, that is GORGEOUS!